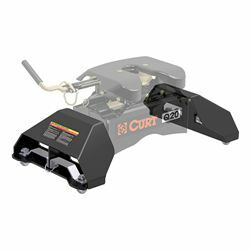 Is there an adapter for my OEM Prep Kit to a Curt Fifth Wheel? To make this installation easier, remove the fifth wheel head assembly from the body of the hitch. Refer to the fifth wheel's owners manual on how to remove the head properly. On the mid section of the fifth wheel hitch, you will find three hole levels. The top level is for 13" setting, the middle holes are for the 15" settings and the bottom holes are for he 17" setting. For this example, the hitch will be installed at the 13" setting. Make sure that the leg assembly with the operating instructions label is positioned on the drivers side of the hitch. Test the mid section of the hitch using the M14 hex bolts, washers and nylon nuts that are supplied with the fifth wheel head unit. Loostly fasten the bolts and tighten the hardware just enough for the legs to be snug against the body. Locate the cross support weldment and position it under the head unit. Loosely attach the cross support between the two leg assemblies, with the provided M14 hex bolts, lock washers and flat washers. Attach both sides of the cross section to the fifth wheel legs. 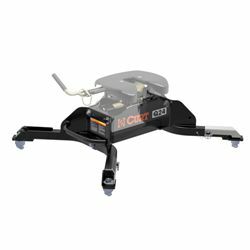 Slightly loosen the hardware that attaches the legs to the body to allow the fifth wheel to shift into the correct position when mounting. Lift the fifth wheel unit into the truck bed and set it near the mounting holes. Remove all four mounting hole caps. Open the locking handles by removing the pins and swinging the handles completely open. Do this on all four legs. Lift up the legs and drop them into the mounting holes on the truck. Torque all six M14 bolts to the value specified in the installation instructions. Reinstall the fifth wheel head. With the legs secured and positioned in the truck bed mounts, rotate the handles back into the closing position and secure with the pins. Slight resistance should be felt as the handles are being closed. Remove the red sticker on the drivers side leg weldment, and replace it with the 5th wheel head operations sticker.